The county commissioners organized Scambler township on August 8, 1871, in response to a petition signed by a majority of the legal voters of township 137, range 43. The record states that the name Scambler was given the township according to the request of the petitioners. The first election was held at the house of R. Scambler in whose honor the township was named. Congressional township 137, range 42 (now known as Dunn township) was attached to Scambler on September 4, 1873, and remained a part of this township until it was created as an independent civil township on March 16, 1880. The reasons given by the legal voters who petitioned the commissioners to attach township 137, range 42, to the township of Scambler are given verbatim: "That township 137, range 42, does not contain legal voters enough to be organized and is also principle timber and lakes and without the prospect of being settled for sometime so as to be organized separately." The following is a list of the petitioners: O. A. Burdick, S. C. Hyde, E. T. Hardison, F. Stockwell, Sr., John Wood, C. P. Hyde, Isaac Johnson, Isaac D. Johnson. James Mathewson, S. Swetland, A. R. Baker, I. G. Dean; N. A. Hoyt, William Beaver, C. W. Hunter, Henry Beaver, R. W. Bordson, John Knutson, T. Slatt, O. R. Thompson, Erik Arubbsen, Amund Olsen, Thor Helgesen, Mantor Binhein, James T. Thorn, Hiram Thorn, O. B. Todd and T. B. Connish. Scambler township is the extreme western township of range 137. The excellent farming land to be found in the township was responsible for its early settlement and today it has some of the best improved farms in the county. The largest lake in the township is Pelican, about half of which is in Dunn township to the east. 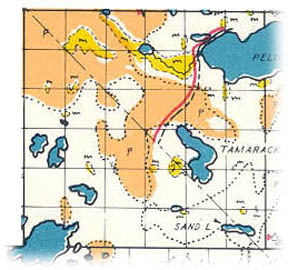 Other lakes in the township are Tamarack, Sand, Pete, Harrison, Rankley and Grove. The surface of the township is rolling, but not so broken as to render much of the land unfit for cultivation. The first approach to a village in the township was made in the northern part of section 2,where an embryonic village by the name of Pelican Lake was flourishing in the latter part of the seventies. Here were clustered some dozen buildings, including a store and a blacksmith shop. For several years a post office was maintained here, but it was discontinued in 1905 when the rural free delivery was established out of Pelican Rapids. There was another post office at Bangor in section 34 which was maintained until the free delivery caused it to be discontinued in 1903. At the present time there is not a store at either place and the township is not able to boast of a village of any kind. There have been been two summer resorts platted on the north shore of Pelican lake, Clear View and Pelican Beach. The former is located in section 1 and was platted by Martin Aalberg for Jennie M. King in the fall of 1900, the plat being recorded on August 4 of the same year. Pelican Beach is in section 2 and was platted by O. C. Molden in 1912 for O. M. and Cora E. Carr. The plat was recorded on August 19, 1912. The first church was established in the township in the seventies and stood in section 33. A cemetery was maintained in connection with the church, and another burial ground was located in section 27. Today there are two churches in the township both being in section 33. The town hall is in section 22. The present township officers are as follow: Supervisors, H. J. Hanson, P. E. Reynolds and John Sim; clerk, W. W. Sherman; treasurer, Simon Olson; assessor, S. A. Syverson; justice, Ole T. Berg. Places of birth for Scambler Township in the 1905 state census.